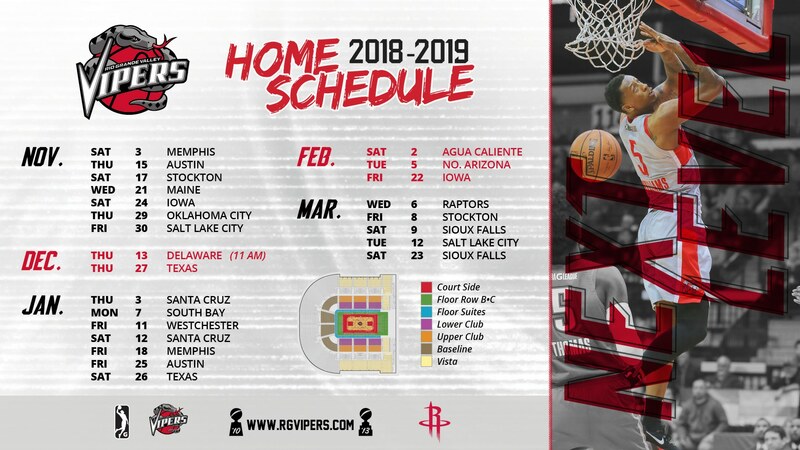 EDINBURG, Texas (Jan. 18, 2019) – The Rio Grande Valley Vipers (17-10) defeated the Memphis Hustle (16-11), 129-112, on a home win Friday night. Gary Payton ll drained 31 points on the night, a new season high. Memphis found themselves on the losing end of a high energy first quarter as the Vipers inched past 35-32 by the end of the period. Payton ll led the scoring effort for RGV while Tarik Phillip was the man on offense for the Hustle with seven points. Jordan Johnson dished out three assists in the early period to aid the offense. As the half-time break rolled around more of the same continued for the home Vipers. They went into the locker room boasting an eleven-point lead 72-61. Michael Frazier took over on offense and posted 15 points by the end of the half. Jacobi Boykins closely followed with 12 individual points, he was perfect from the field going 4-4 and shot 100% from the charity stripe (2-2). Phillip ended the half for the Hustle with 12 points, three assists. RGV used their fast tempo attack to unbalance Memphis in the half and it proved to be the difference maker as the Vipers shot for nearly 60% from the field. RGV enjoyed a seven-point lead as the third quarter rolled to an end, 107-100. Payton ll was on fire, he tallied 25 points and dished out three assists. Frazier was relentless on offense as his point total rose to 20 by the end of the period. Tyler Harvey matched Phillip on offense as they both put up 20 points apiece for the Hustle. Defensively for the Vipers, Chris Walker grabbed 10 rebounds and totaled 12 on the night as he secured the double-double performance, adding on 14 points. Memphis ended the night shooting just over 48% from the field, Harvey tallied 22 points. Phillip finalized his stat line with 25 points, four assists, and three defensive rebounds. On the night the Vipers shot over 53% from the field and drained 16 threes to math their usual fast tempo offense. The Vipers make the trip to the west coast as they take on South Bay on January 20. Tipoff will be at 5 p.m. For more information, contact the RGV Vipers at 956-56-ARENA or visit www.rgvipers.com.